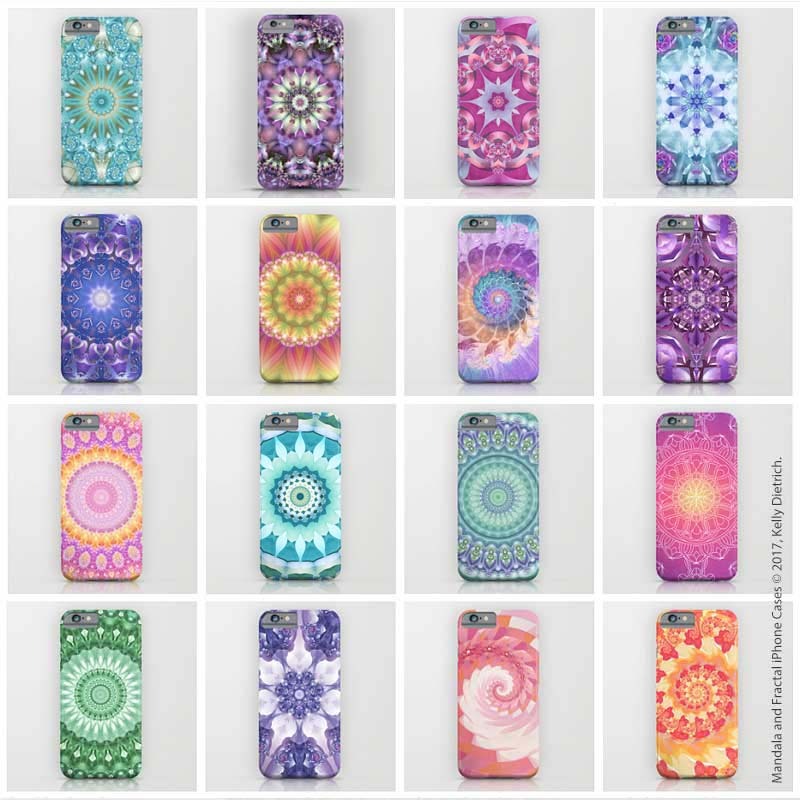 A selection of iPhone cases I've designed. Available in my Society6 shop. I think most of us would like to find an easy and reliable way to make a passive income. Being no different, I decided to check out one of the most frequently mentioned ideas, especially for artists and graphic designers: print on demand sites (PODs). Many PODs have been around quite a few years now, but there are more and more of them popping up all the time. At the end of last year, I decided to jump into the fray and see what happened. This is my first post, with a few more to come, detailing what I learned about print on demand and how you can get started too. So what are PODs? They're sites where illustrators, photographers, and artists of nearly every stripe can go to sell their artwork on a variety of products like throw pillows, phone cases, and t-shirts. In exchange for "allowing" them to use your artwork on their products, they'll take care of all aspects of ordering - printing, shipping, and returns. The beauty is that there's no start-up cost and no investing in a big inventory that may or may not sell. Each art print and product is only created once it's been ordered and paid for. Artists also retain copyright of their artwork. You don't have to sign over any copyrights to the PODs. You're only granting them the ability to print your images on their products. That being said, always read the terms of service agreement before you sign up so there won't be any surprises later. To me, all of these reasons sounded terrific. A few years ago, I stopped updating my Etsy shop because I was tired of wearing so many hats — artist, advertiser, packer, shipper, and customer service representative all rolled into one. Print on demand sites seemed like a great way to just be creative without having to worry about wearing all the other hats. Getting set up with a POD is pretty quick and painless, at least with the sites I tried out. While each site is unique, all you usually need to do in order to get started is to set up a username, shop name, and payment information. After that, you're all set to start uploading your images to your shop! Once you have products set up and available for purchase, you can expect to make somewhere between 10% - 20% on whatever products you sell, although this varies depending upon both the site and the specific product. PayPal is the most common method of payment for PODs, but some sites do offer direct deposit or checks. But, you don't get paid right away. Instead, you'll need to wait through a buffer period which is usually somewhere around 45 to 60 days. By that time, the entire transaction will have taken place — from placement of the order, printing and shipping, and finally, to the customer receiving the merchandise. What I looked for were sites that were well established and that offered a wide variety of products. Also, I’d already joined Society6 in 2013 and RedBubble in 2015, so all I needed to do was start uploading images! For artists just getting started with print on demand, you'll need to do a bit of homework. Visit all the websites. By looking at the products each site features, you’ll soon get a feel for which sites will be the right match for your artwork. For instance, if you're primarily interested in creating t-shirt designs, you might want to try Threadless, Teespring, or TeePublic first. But if you're a photographer with a body of work not particularly suited to just one type of product, maybe Fine Art America or Society6 is your best choice. By doing just a little bit of legwork before diving in, you’ll save yourself a lot of time in the long run. Below, I've included a list of print on demand companies that I created for myself to check out over the course of 2017. Some new ones have popped up in that time while others have shut down. To me, that's why I feel it's so important to go with a company that's been around for several years when you're starting your first shop. It can be very time consuming to get all the products set up just as you want them, so imagine putting all your artwork on a POD that then closes in a month or two! Choose wisely your first time. Another thing to keep in mind about this list — it’s far from complete. Most of the companies I've listed are in the English language or have English language sites. I'm sure I've missed many others, and, additionally, I've simply not included foreign language sites. If you know of a site I've not mentioned, please leave a comment and I'll add it to the list. Finally, one last thing about the POD list. Most of the companies listed will just let you sign up for an account and get started right away. There are some exceptions, though. Those sites marked with an * require you submit your portfolio and go through an approval process. Sites marked with ** have design challenges, and the winner's designs are then featured on products. There are no artist "shops." Finally, Merch by Amazon is unique in that once you sign up, your name goes on a list which I've heard can be several months' wait. Also, Merch is for t-shirts only. So keep all of this in mind if you want to get your shops going asap. Originally, this was going to be a little post about what I'd learned my first year working with print on demand sites. But, the article quickly became very long, and I needed to chop it into several entries. So check back soon for another post about my venture into print on demand!